Just returned from a week vacation on the Outer Banks of North Carolina and attempting to catch up on market events from last week as I stayed relatively disconnected from technology. The family drove from Ohio to the Outer Banks and if the traffic on the way there, as well as activity on OBX has any economic significance, the economy is strong. Confirming this strength were a few economic reports last week, durable goods and GDP. Although the headline durable goods orders of 1.0% missed expectations of 3.2%, strength was seen in core capital goods and unfilled orders. Core capital goods rose .6% and exceeded the .5% consensus expectation. Overall this is a strong report. Then on Friday the advance estimate of second quarter GDP was reported at an annual rate of 4.1%. The last 4%+ GDP print was Q3 2014 when the rate was 4.9%. According to the Commerce Department on the Q2 2018 GDP report, "The acceleration in real GDP growth in the second quarter reflected accelerations in PCE and in exports, a smaller decrease in residential fixed investment, and accelerations in federal government spending and in state and local spending. These movements were partly offset by a downturn in private inventory investment and a deceleration in nonresidential fixed investment. Imports decelerated." The weak economic report for the week was a miss in the existing home sales report which have now been soft for three consecutive months. This is something to keep an eye on. From an equity market perspective, seems the market moving event was the earnings report by Facebook (FB), which I will not repeat here. For large cap U.S. stocks, the S&P 500 Index has now closed up for four consecutive weeks. On a monthly basis, the S&P is working on a four month winning streak as well. 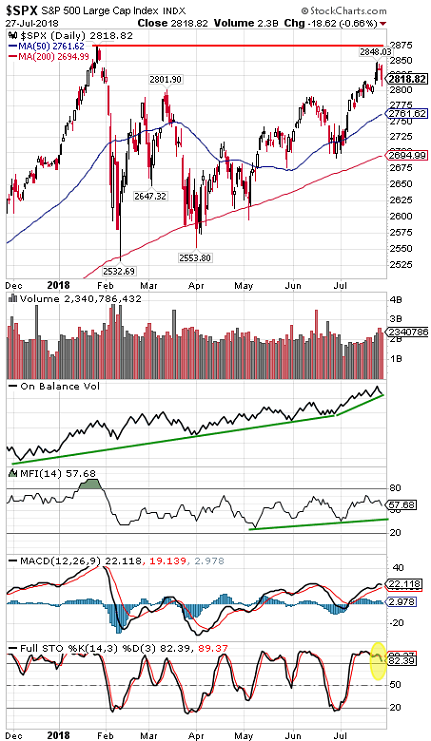 This move higher in the S&P 500 Index is placing the index near resistance of the market's late January high. What has worked better than the S&P 500 Index though has been small cap stocks. 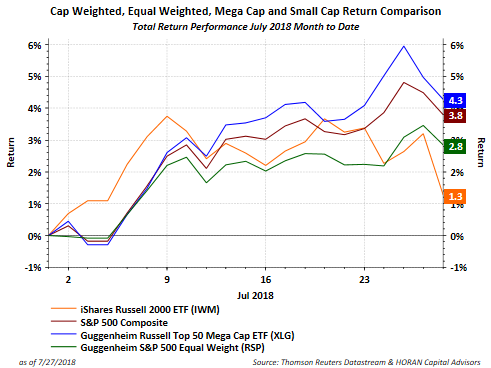 The below charts shows the year to date 2018 performance of small caps as measured by the iShares Russell 2000 Index ETF (IWM). This year the small cap index is up 9.0% versus the S&P 500 Index total return of 6.6%. 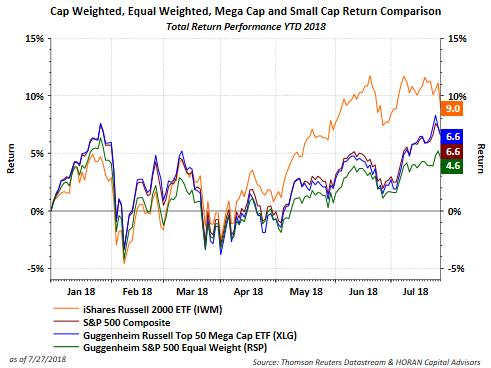 Much has been written about the large cap technology issues driving performance and with that the equal weighted S&P 500 Index is up only 4.6%. Small caps can be viewed as a 'risk on' asset class. For the month to date time period in July though, small cap stocks have begun to exhibit some relative weakness versus large cap stocks. The below chart shows small caps up 1.3% so far in July while the S&P 500 Index is up 3.8%. The winning strategy though is the equal weight index (RSP) which is up 4.3%. This outperformance of the equal weighted S&P 500 Index confirms weakness in the largest of the large cap stocks. 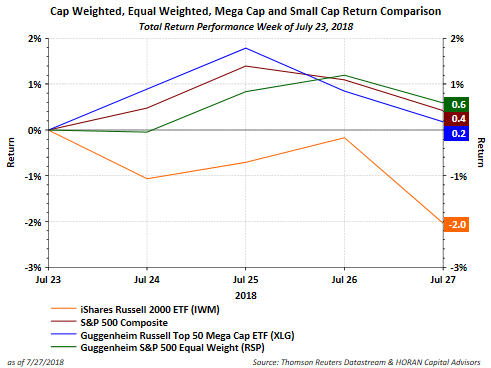 Included on the below chart is the Russell Top 50 Mega Cap ETF (XLG) and it is the weakest performer of the large cap indices shown on the below chart. For the week of July 23, small caps are down 2.0%. With the month of July coming to a close, investors will want to evaluate whether this weakness in small caps, which has been the market leader this year, is a sign of broader weakness as August and September close out summer. Earnings continue to exceed expectations though. Howard Silverblatt of S&P Dow Jones Indices noted Friday in a tweet, "To date 217 S&P 500 issues have reported their quarterly results for Q2,’18, with an amazing 84% beat rate (historically 67%): 183 beat, 20 miss, 14 meet; 156 of 214 beat on sales (72.9%)." At the end of the day, stock prices tend to follow earnings and both the top and bottom lines for companies continue to look strong. Is The Value Style Really In Favor Now? Summer 2018 Investor Letter: A Recession In 2020?